Peresoft is excited to announce the launch of Peresoft TV. At Peresoft TV you can watch short videos packed with information and features that you will find useful. 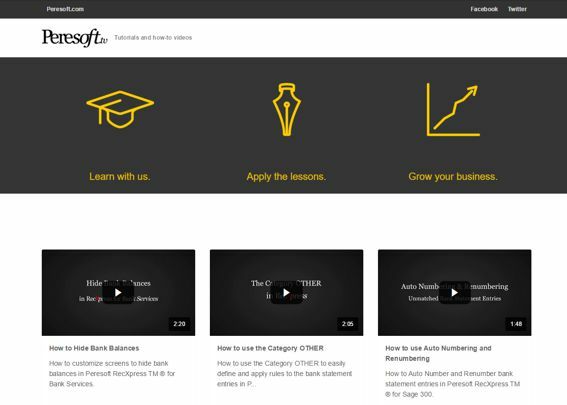 The initial launch comprises 10 training videos. All bank statement entries that are not matched to any rule goes into the category OTHER. Find out how you can create rules directly from bank statement entries. Privacy can be achieved by hiding confidential bank balances because the statement automatically retrieves the correct bank statement. Numbering your bank entries is crutial because you want to group certain entries together. The complete Recxpress for Bank Services tutorial explained step by step. Go through all the feature that are on offer. © 2019 Peresoft Software & Support (Pty) Ltd. All Rights Reserved.